Plants compete with each other over finite resources like water and nutrients, but also for sunlight when they grow in each other’s shadow. 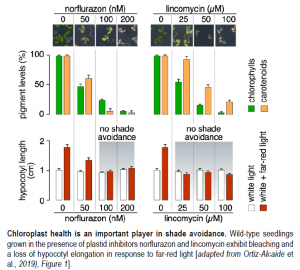 Light filtered through leaves is rich in far-red light and initiates responses, known as shade avoidance syndrome (SAS), that aim to out-compete neighbors by promoting hypocotyl elongation and returning the plant to unobstructed sunlight. The red-light photoreceptors phyA and phyB participate in SAS: In environments rich in far-red light, the balance of photo-inactivated phyB and light-stabilized phyA dictate the extent of hypocotyl elongation (Martínez-García et al., 2014). In addition, canopy shade will eventually compromise chloroplast function and photosynthesis, but whether this contributes to SAS was not known. Here, Ortiz-Alcaide and co-authors establish that chloroplast health is an important factor in SAS, and that the transcription factor ELONGATED HYPOCOTYL 5 (HY5) and the phytohormone abscisic acid (ABA) are key components. SAS assays are simple but powerful: An intact response to shade results in longer hypocotyls in far-red enriched light. The authors treated seedlings with norflurazon or lincomycin to impair chloroplast function. Both norflurazon and lincomycin completely suppressed SAS, although the potential for cell elongation remained intact. One noticeable difference between the two chemicals is that albino seedlings treated with lincomycin accumulate some carotenoids, whereas norflurazon-treated seedlings are close to none (see Figure). Seedlings grown in white light concentrate phyB in nuclear speckles that quickly disperse upon transfer to far-red light as the photoreceptor becomes photo-inactive. Norflurazon and lincomycin both slowed the dispersal of phyB-containing nuclear speckles, and greatly diminished the expression of classical shade-response genes. A longer window of photoactive phyB is consistent with the lack of elongation in treated seedlings. Is that all there is to it? No; but it may not be what you think: classical plastid-to nucleus retrograde signaling mutants behaved normally, and pointed to a new pathway. The authors went on to test the role of the transcription factors HY5 and PHYTOCHROME INTERACTING FACTOR (PIFs) and found that 1) a mutant lacking four PIFs exhibited normal SAS, whereas 2) hy5 mutants showed a stronger response to simulated canopy shade in the absence of plastid inhibitors that 3) was partially and completely suppressed by norflurazon and lincomycin, respectively. That hy5 seedlings treated with norflurazon or lincomycin behaved differently provided a useful clue: the presence of low levels of carotenoids was required for the complete blocking of SAS in albino hy5 seedlings. ABA is derived from carotenoids and was detected only in lincomycin-treated seedings. Albino hy5 seedlings treated with norflurazon and ABA lost their ability to respond to shade, indicating that ABA represses elongation. To close things off, lincomycin-treated hy5 seedlings missing ABA production or signaling components regained partial shade responses, very much like hy5 seedlings grown in the presence of norflurazon. In “short”: the physiological status of chloroplasts contributes to SAS and includes modulation of the elongation growth repressors HY5 and ABA. 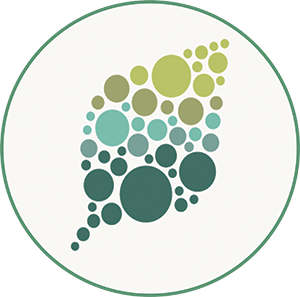 The elucidation of the signaling cascade bridging HY5 and chloroplast health will provide important clues concerning organellar control of nuclear gene expression. Martínez-García JF, Gallemí M, Molina-Contreras MJ, Llorente B, Bevilaqua MR, Quail PH (2014). The shade avoidance syndrome in Arabidopsis: the antagonistic role of phytochrome a and B differentiates vegetation proximity and canopy shade. PLoS One 9: e109275.